LEDs were first introduced in 1962, used originally as indicator lights. Although light output has increased significantly in recent years, the basic packaging method remains largely unchanged. The industry standard is still assembled one LED chip at a time. One LED is placed in a reflective cavity, bonded to two electrical contacts, and then sealed by an epoxy or plastic lens. Fiilex on the other hand takes a completely new approach. Instead of individually wrapped LED chips, Fiilex applies a brand new platform that densely packs many Light Emitting Diodes (LED's) together within one reflective lens. For example, our P360 light uses a dense matrix platform that boasts 56 LED chips in an area smaller than a dime! This patented design is the result of over 30 million dollars in investments and ten+ years of diligent research by Fiilex's Parent Company: DiCon Fiberoptics. Its team of PHD's found a way to fundamentally resolve the thermal issue and invented a metal carrier that quickly dissipates heat away from the core. With this advanced innovation, Fiilex is able to design products that are able to operate at high currents and emit more light. This light can then be effectively focused into intense beams while maintaining a core temperature vastly cooler than traditional lights. Through this patented platform, Fiilex has easily conquered the two biggest challenges in designing LED fixtures, beam control and heat management. The compact placement of LEDs resulted the creation of the Dense Matrix LED, a powerful array that is no larger than the size of a dime and is easily adaptable to a variety of applications. 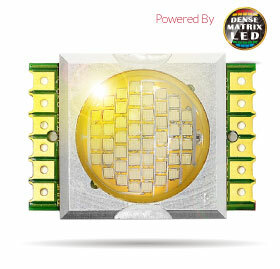 By grouping a number of high power LED chips together with multiple independently controlled channels, the Dense Matrix LED is able to emit intense specular light with incredible CRI that can be tuned to produce a variety of colors and spectrums without the hassle of needing multiple units. Through this technology, Fiilex is able to offer users an advantageous alternative to traditional lighting that boasts a significantly lower carbon footprint. Welcome to the era of digital lighting! We welcome you to visit us at the National Association of Broadcasters Show. It is happening now at the Las Vegas Convention Center, exhibits are open from April 8-11th. The theme of this year's tradeshow "where the content comes to life" is very suitable for us, we feel great pride knowing our equipment is used professionally for still and motion image creation. The process of production is changing rapidly but the excitement of witnessing the final product come to life causes a feeling inside that is both satisfying and rewarding. Fiilex Light Kits, optimal for news and professional videography, provide users the advantage of a 3 light set-up while remaining portable and versatile. And it's ready to go right out of the box! Battery or A/C powered, Fiilex lights are designed for studio and portable use. These all-purpose lights are designed for effortless travel, quick setup and seamless operation. • Light Stand - Folded Length = 21.7" Max Height = 78"
Fiilex is proud to announce The Camera Store as it's first Canadian dealer. The Camera Store recognized Fiilex as a unique product very early in the year and was excited to bring in our new products. We recognized them as a high quality retailer with excellent customer service. The Camera Store first opened in Calgary in 1996 and has become known as best place to go for everything photographic. As a premier photo and video outlet, The Camera Store is a full line dealer for the entire range of photographic equipment and supplies. They have one of the largest selections of cameras to choose from including everything from compact digital, DSLR and video cameras to toy, pinhole and instant cameras. They also have all of the lenses and accessories that you could imagine. The Camera Store provides online sales and is gaining recognition nationally. Their win of Consumer Choice Award for Best Camera Store in Calgary has greatly contributed to their recognition with professionals and the general public across the country. Fiilex is also excited to announce Bear Images as a dealer. Based in the San Francisco Bay Area of California, they bring expertise in various fields of study within the photographic and motion picture industry. We are pleased with Bear Images' ability to answer any question that comes their way and give the level of service our customers need. Bear Images Photographic, Inc. focuses on supplying the finest equipment and solutions to professional still and motion imaging specialists. Since 1982 a very simple policy has lead our selection of products and solutions: 'We only offer products and solutions that we would either buy ourselves or recommend to a friend.' "The Fiilex LED lights clearly meet this criteria as it is exceptionally suitable, purposely built to produce quality illumination for a wide variety of imaging applications." Says Jim Taskett, owner of Bear Images.